Thirsty Pilgrim: Don't Mock the Snow. Our first mistake: telling our guests it never snows here. 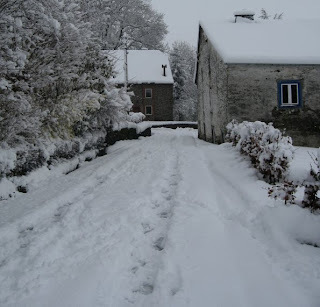 As the four of us tooled around the Ardennes, flurries and sleet made intermittent appearances. We laughed it off and kept trying beers. Well, they tried beers. I was driving, until we got settled into Achouffe that evening. Then I think we hit every pub in the village... all three of them. Their quasi-Alpine, ski-lodge feel was a good fit for the weather, which we still managed to ignore. Also appropriate: the dark, malty and warming McChouffe. Getting that last bit of winter out of our systems. Or so we thought. Back to the brewery for dinner. I went with the regional menu: Ardennes ham, fresh trout and apple pie. 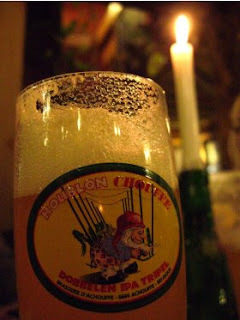 But the real treat for me was the Chouffe Houblon on draft. This is an extra-hoppy tripel, 9 percent strong, that Achouffe makes it for my fellow American beer nerds and our lupulin-hooked palates. 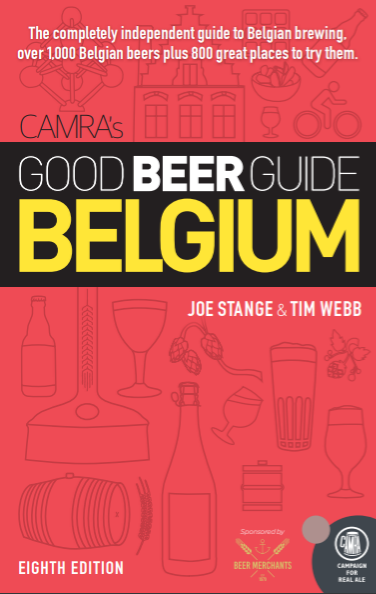 Too bad it's nearly impossible to find in Belgium. Having it kegged at the source meant a fresher hop flavor. Some spicy Thai food and a summer day would have made a better match for this beer. I had three glasses of the stuff, trying to will away the blizzard. No luck. We left the restaurant to find six inches on the ground. We alternately drove and pushed the car up and around a mile-long hill to our B&B. It was touch and go there for a bit. We courteously pulled aside a fallen pine tree for local drivers too scared to try the brakes. And we woke up the next morning, backs sore, to a foot of snow. In late March. Somehow, we knew, this was Al Gore's fault. And We Got No Principals. Beery Wishes and Salty Fishes.